If you are going to steal, steal from the best. 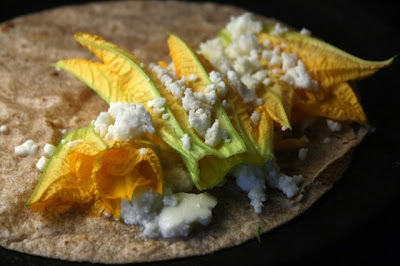 I first heard about soft Mexican Chorizo being used as a marinade from pop-up chef Ludo Lefebvre at LudoBites 6.0. I have not had the pleasure to reserve a seat to try out his unique flavors (LudoBites usually books-up in minutes for the short month, or two, long run.) But, I do like to read all about his clever and tasty sounding dishes - you can click here to see what I am talking about. One entree that did catch my attention is his Chorizo Half Chicken. 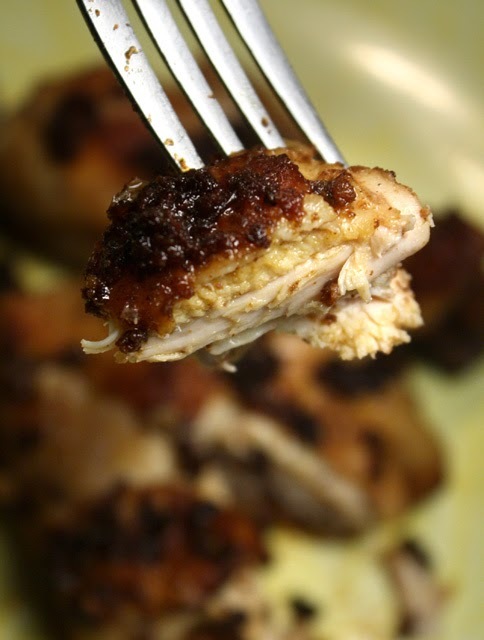 What a cool idea: just marinate chicken in creamy, spicy Mexican Chorizo. He cooks the dish sous-vide. Which means sealing the chicken and chorizo in a plastic bag and slow cooking it for hours. If you want to give sous-vide a try, our local newspaper, The Los Angeles Times, shows you how to do it simply at home -- click here for a video and print instructions. 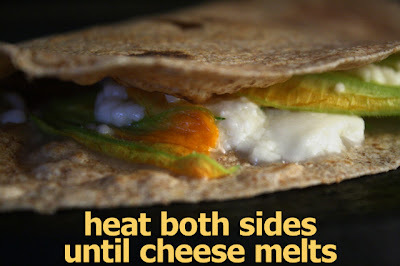 Since I've never eaten at a LudoBites, this recipe is delectable guesswork. This French Top Chef contender is a fan of incorporating local California flavors into his European cooking repertoire. 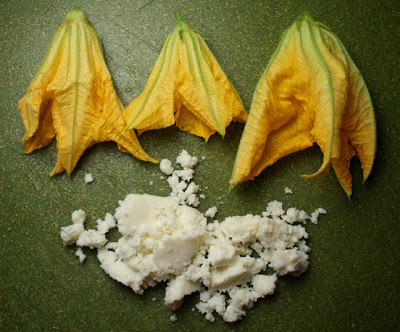 And when he does a pop-up restaurant in L.A., that means using California farmers market produce, and Mexican ingredients, too. 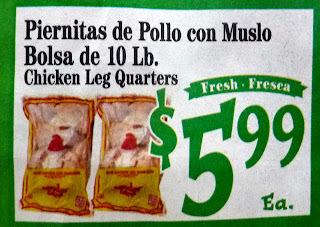 Chicken is the cheapest protein and I get it at my local Latin market for way below 99 cents per pound -- actually, 59 cents per pound for a 10 pound bag! The bag holds leg quarters, but I'm fine with that. 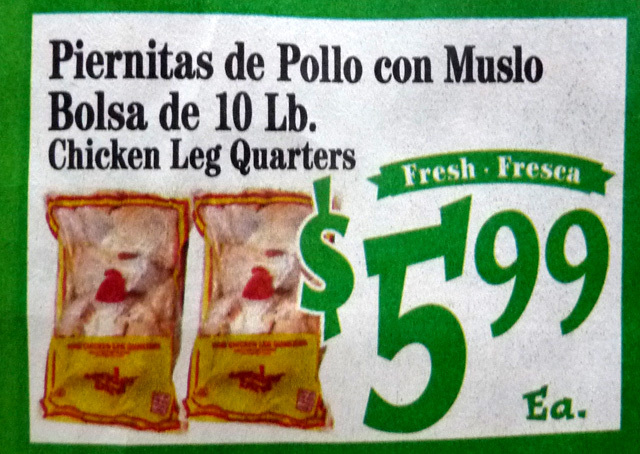 I've also bought bone-in white meat breast for 99 cents per pound, on sale at regular grocery stores. 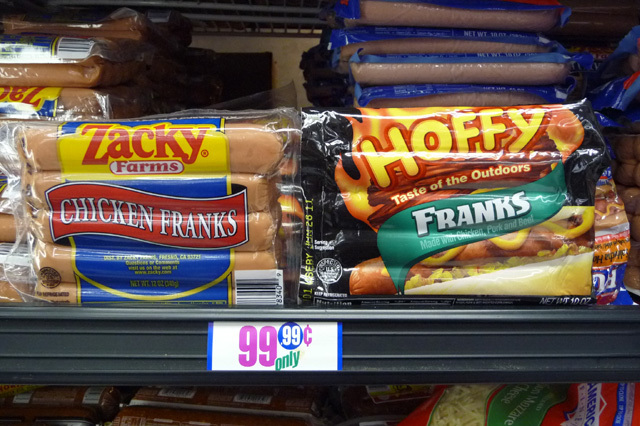 White meat is easy to overcook and dry out, so I prefer the cheaper cuts. 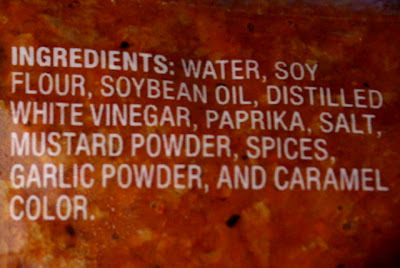 Mexican Chorizo is made with Pork, Beef, and recently, Soy. I used a Beef Chorizo for this recipe. 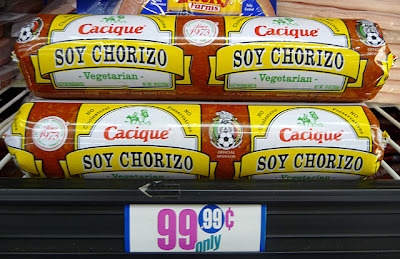 Last week I reviewed a vegetarian Soy Chorizo and gave it a top score of 9 -- I'm sure it would work as well. 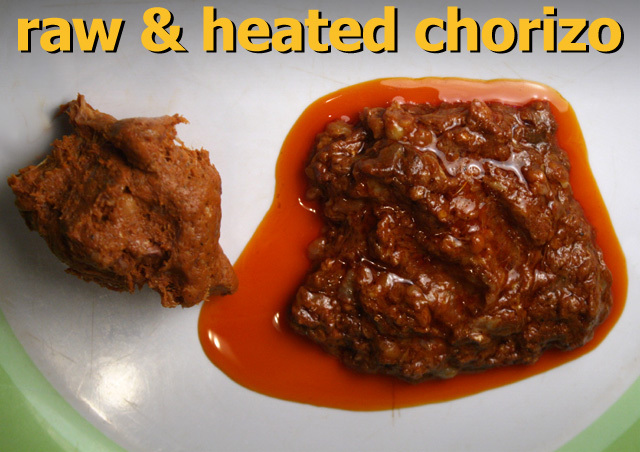 Mexican Chorizo is like a paste, so you just heat it up and smear it on. 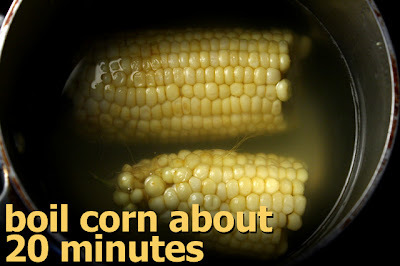 Then all you do is cover the pan and cook until done -- it couldn't be simpler. The end result is spicy and mucho delicioso. 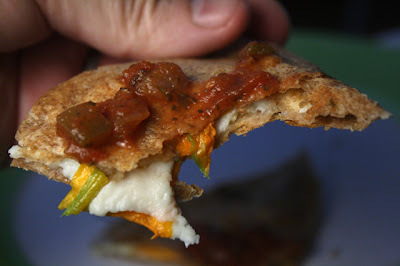 I am a fan of Mexican Chorizo, and have used it in several recipes (click on name for recipe link): Chorizo and Eggs, Mexi-Turkey Burger, Stuffed Bell Peppers, and now, Sauteed Chicken and Chorizo. 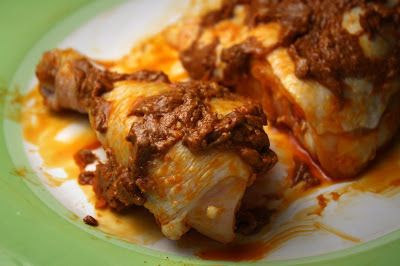 2 chicken pieces - I used a thigh and leg. 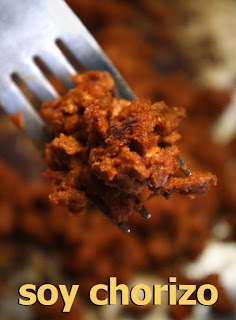 2 tablespoons of Mexican Chorizo. Don't use hard Spanish Chorizo for this recipe. 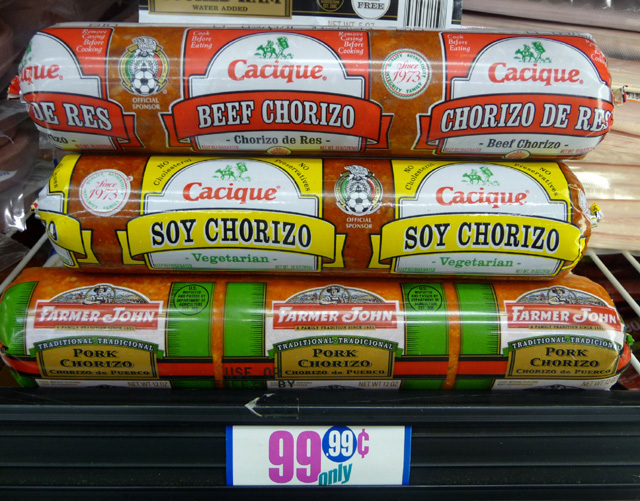 Mexican Chorizo is soft like pate, and stored in a plastic casing. I use one heaping tablespoon per chicken piece. While a saute pan is coming up to low/medium heat, put chorizo in a bowl and microwave for about 10-15 seconds -- until chorizo is soft and oil is starting to separate. Add chorizo coated chicken to saute pan. Cover pan and reduce heat to low/medium. 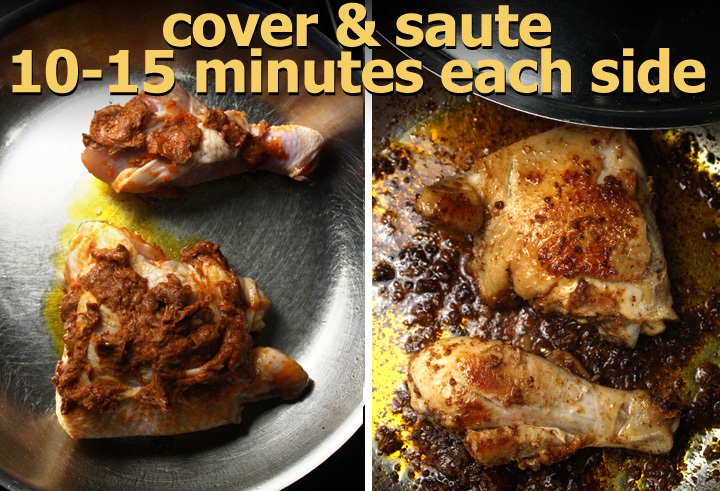 You want to slowly cook chicken covered, for about 10 - 15 minutes, each side. Done when chicken juices run clear -- just slice into it to make sure there is no red or pink color at the bone. It's really good! I just noticed this Soy Chorizo one day at the 99c only Store in Hollywood. I did a double take and thought, "why not try it?" When I first spied it next to the Beef and Pork Chorizo, I read "Soy" as the Mexican word for "I am," as in "Soy Mexican" (I'm Mexican), not "Soy" as in vegetarian. 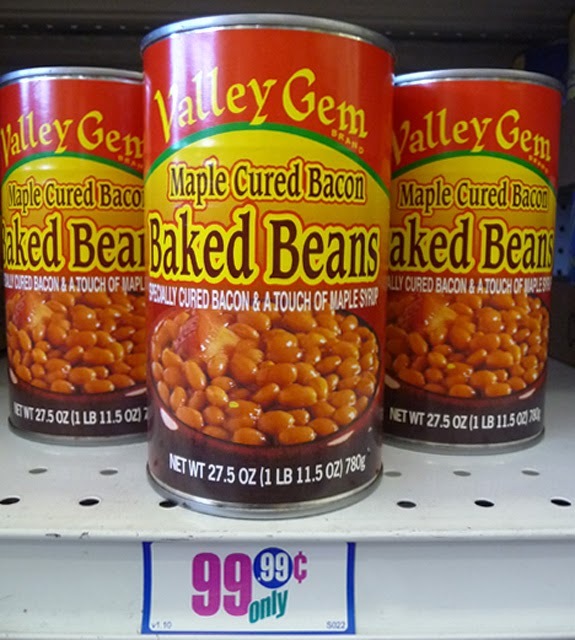 For 99.99 cents, it 's the right price for this Chintz Chef, so I thought this would make an interesting Deal of the Day. I was not disappointed. 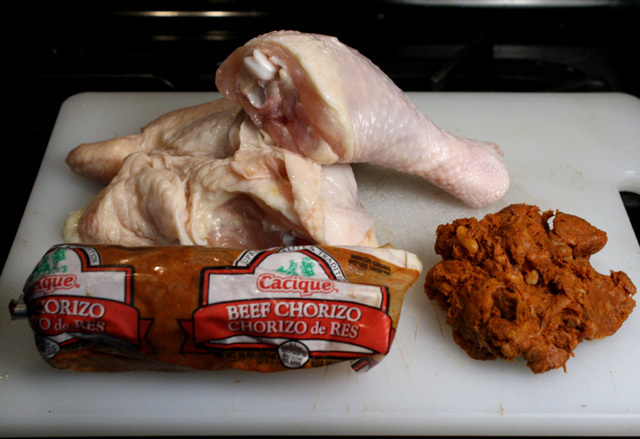 Normally Mexican style chorizo is soft like raw ground meat. 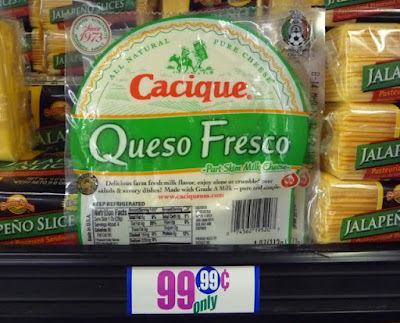 This Soy Chorizo, by Cacique, is similar, but with a cooked ground beef crumbly texture, too. Spice-wise you would be hard pressed to tell the difference to regular chorizo - it's still chile flavored and spicy hot. 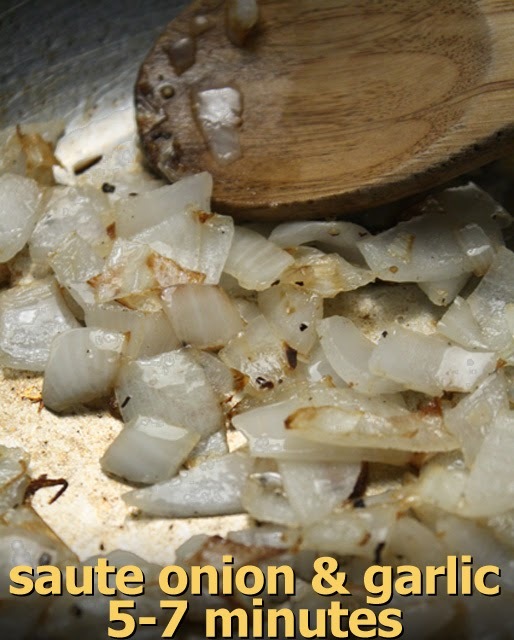 Since there is no meat, or fat, you may want to add a splash of oil if you are using a regular pan. 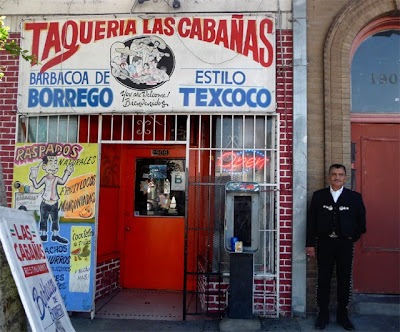 I guess what I miss the most is the grease that is rendered when a meat chorizo is browned -- it's so pungent and very flavorful. 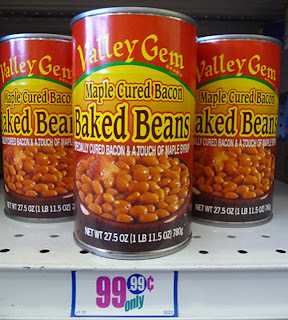 But, for calorie watchers, this is a great alternative. 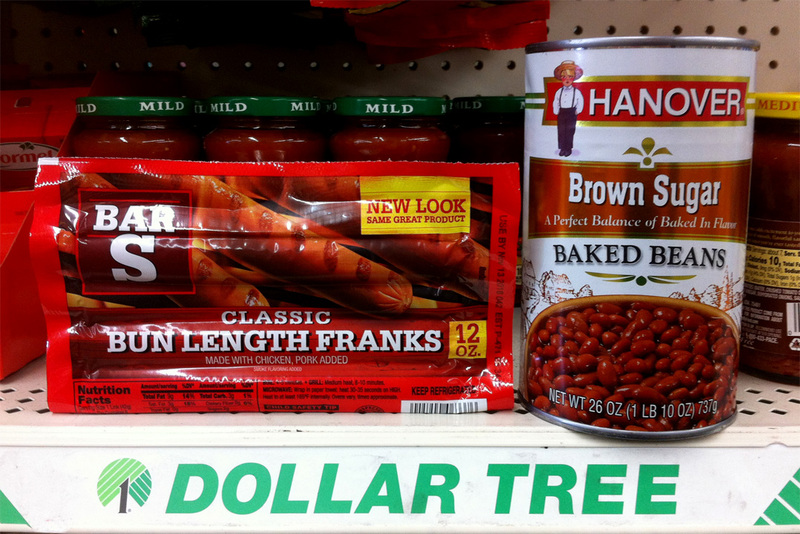 The ingredient list is short, unlike real chorizo that has a long list of organ meats. Read the package to see for yourself, or go to Cacique's website here. 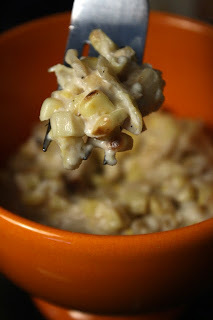 The best way to try out a new food product, I've found, is to use it in an egg scramble. 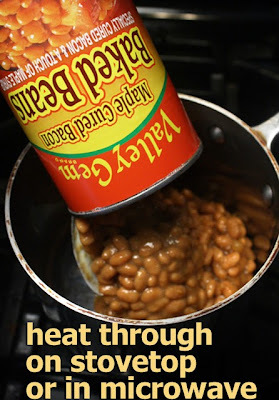 This also works well if you don't know a spice and want to try it out in a recipe, cheaply and quickly. 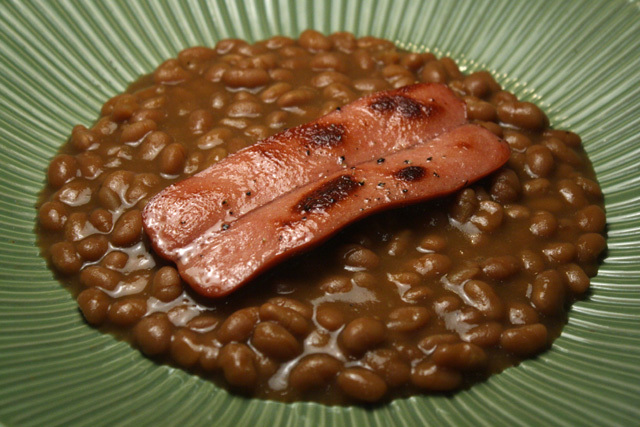 The Soy Chorizo squeezes out of the plastic skin easily. 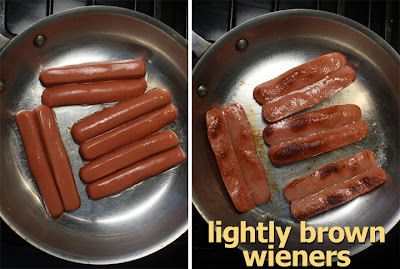 I used about a third of the 8 ounces, and added a tablespoon of oil, as soy chorizo sticks to the pan, unlike meat chorizo which has some fat and greasy bits in the mixture. This Soy Chorizo is already cooked, so you just need to heat it through to bring out the flavors in the chile and spice paste. After about three minutes of stirring, I added two eggs to scramble. 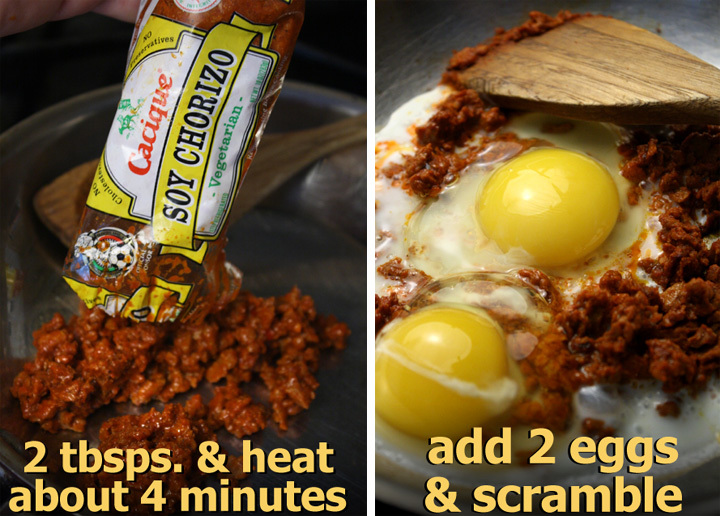 The chorizo flavors mix well with scrambled eggs -- savory and spicy. It's a light breakfast, and a tasty change of pace. You would not eat it by itself from the package, but you could add Cacique Soy Chorizo to many dishes as a flavoring. 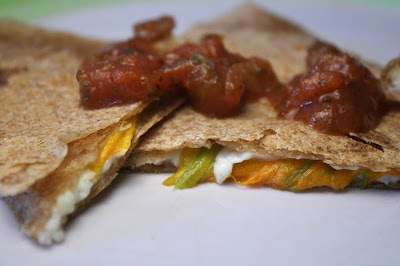 I have several Mexican Chorizo dishes I've already made, just click on a name to see my recipe: Chorizo & Eggs Breakfast Tacos, Stuffed Bell Peppers, Mexi/Turkey Burger and Seafood Paella. So on a scale of 1 to 9, nine being best, I give this Deal of the Day, Cacique Soy Chorizo, a tasty 9! I will definitely be using this product again -- especially as a light, spicy, breakfast taco start to my day. 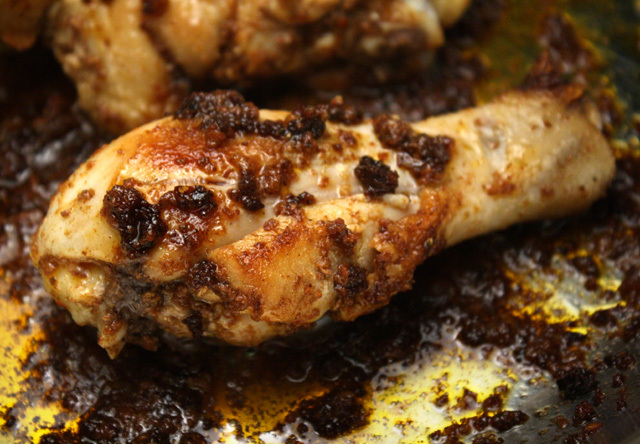 And check back next week for another Mexican Chorizo recipe: Sauteed Chicken and Chorizo. 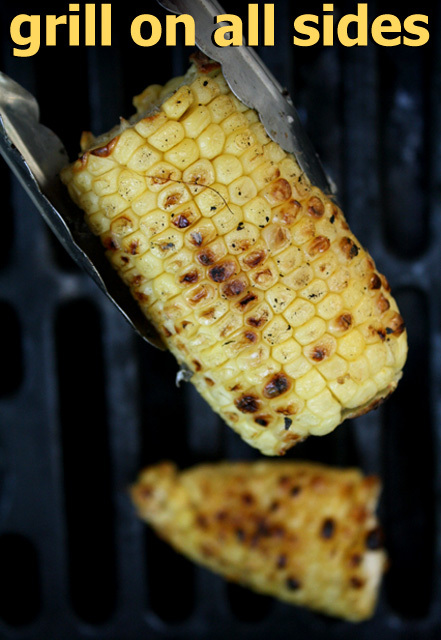 Sweet, hot and with a sensuous texture, is the way this culinary cheapskate likes it! 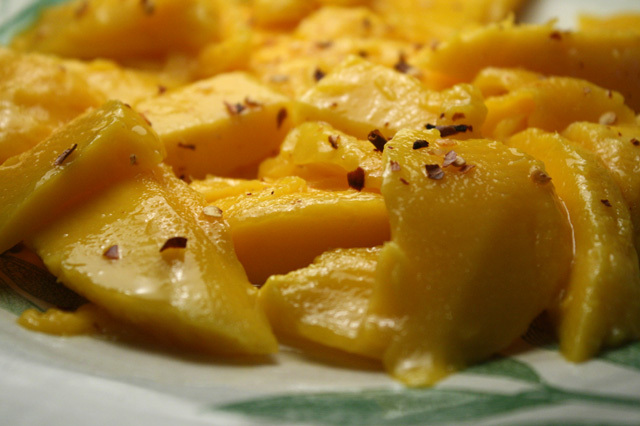 Mangos are just too darn sweet sometimes, so this recipe is a great change of pace. It is simple to do and you control the heat. All you do is sprinkle crushed red chile flakes over sliced mango, followed by a bath of fresh lime juice. 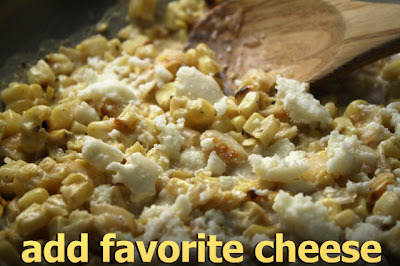 It's a great flavor profile: sour, sweet and spicy. It's a delicate balance, but you can add the red pepper flake and lime juice a little at a time, until you get it right. Ripe sweet mango can take the sour heat. 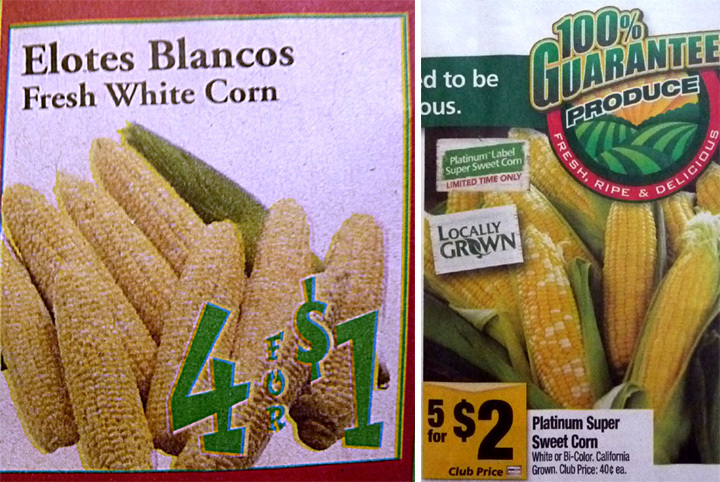 My local Latin market always has mangos on sale. You may have to stalk your regular grocery store until they reduce prices, but my latest sweet side dish is worth the wait. This tasty treat is another reason for you to get familiar with local ethnic markets. 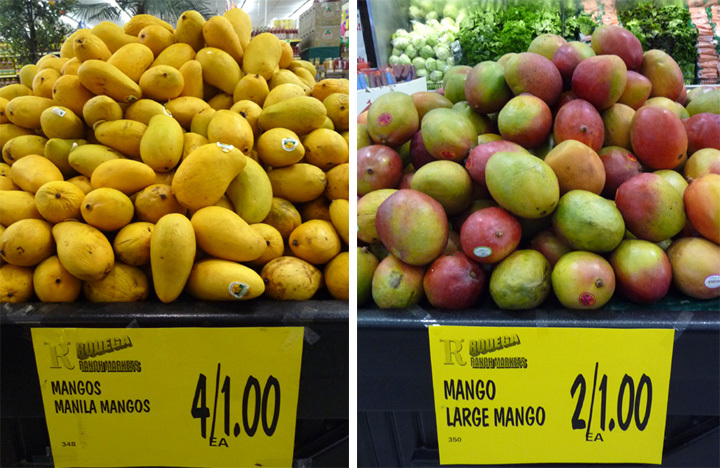 Mine stocks every type, from huge Mexican mangos to small Manila mangos, both way cheap. 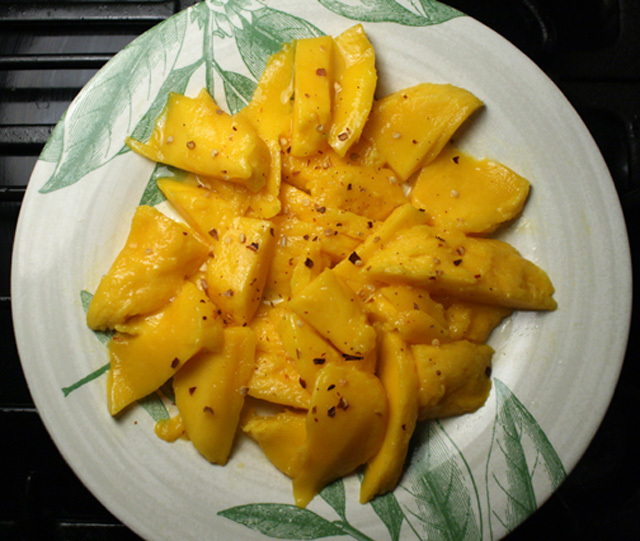 I was pleasantly surprised when I first tried Spicy Mango -- the addition of crushed red pepper did not overpower everything -- it pairs perfectly with honeyed mango. I've also included a photo-tutorial on how to peel a mango -- it's the least messy way I've found. In the waning days of summer, this 'mango salad' makes a great addition to the menu for a backyard Labor Day BBQ or patio gathering. 1 large mango - or 2 small ones. 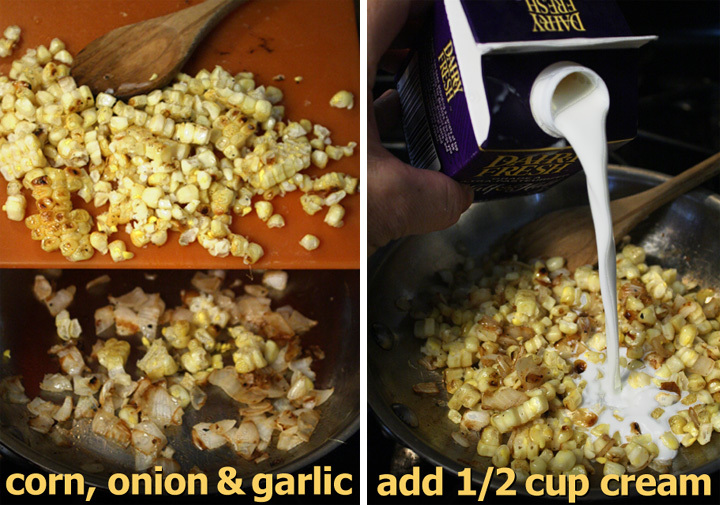 1 teaspoon crushed red pepper flakes - you may want to add half the amount and taste for heat. 1 tablespoon of lime juice - fresh or from a bottle. Okay to use lemon juice. 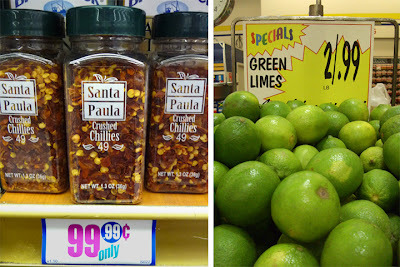 *Spicy substitution: a whole chopped jalapeno (remove seeds) - of course, add a little at a time to suit your heat tolerance. Peel ripe mango(s). They should be yellow (some are flecked and airbrushed with red and green), and soft but not mushy. I like to peel half a mango at a time; it's less messy. Cut just deep enough, through the skin, with four slices -- lengthwise, connecting cuts top to bottom. 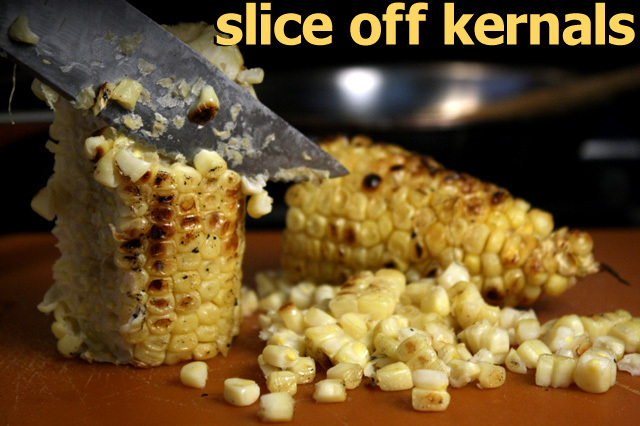 Peel off half the skin (2 slices) on one of the wide sides (the seed is thin and flat like an oval hubcap.) Sometimes the skin will break, so peel until skin of one half side is removed. Now all you have to do is slice off the flesh to the seed. You can make large or small slices, or cut crosshatches to make cubes. Next peel the skin off half of the other side (one quarter) of the mango. Slice or cube-cut the flesh. Finally, peel the last quarter and cut the remaining flesh. 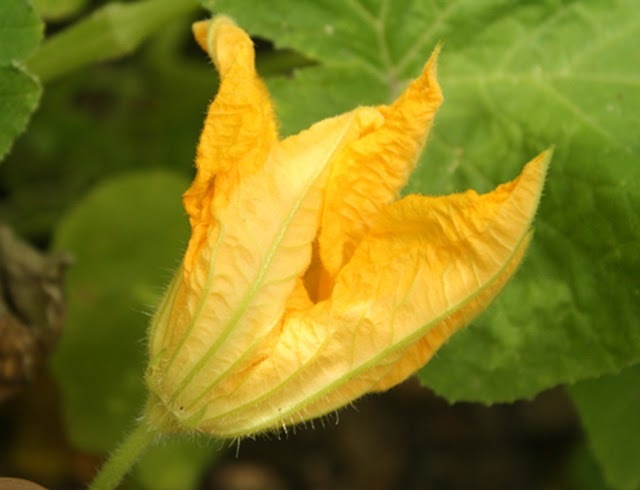 You may be able to work more fruit off the seed at this point. You can cut the mango into uniform bites or leave it roughly cut. In a bowl or plate, arrange cut fruit and sprinkle on red pepper flakes. Be sure to distribute evenly, so you don't get extra hot spots. Adjust amount to suit your taste. Finally drizzle on a tablespoon of lime juice. You can serve this salad cold or at room temperature.